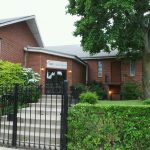 Journey to Peace is offered at the Bronx locations of Seeking Shalom. These locations are convenient for both Bronx counseling and Upper Manhattan counseling. You are welcome to come to either of these locations. For appointment availability, please consult the Appointments page or call the staff person that you are interested in working with. 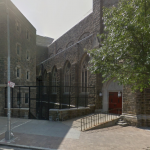 Located in the parish offices of St Nicholas of Tolentine Church at the corner of University Ave and Fordham Road. Note that if you arrive when the parish offices are closed, you may need to call the person you are seeing in order to get into the building. This location is easily accessed by the Bx3 bus (which runs from the George Washington Bus Terminal to Kingsbridge/Riverdale) and the Bx12/Bx12SBS bus (which runs from Inwood across the Bronx to Co-op City). The Fordham Road stop of the 4 train is blocks away and just a little further is the Fordham Road B/D station and the 207th St station of the 1 train. For those driving, parking in the area can be tight, however, there is a municipal parking garage on Jerome Ave just north of Fordham Road, where rates are affordable on an hourly basis. This is one of the advantages of this Bronx counseling location. We are not in the church (on the right) but in the building next to it. Our office is in this building that includes the parish offices. Angela and Wayne both have regularly scheduled hours at this location. 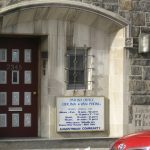 Located on the campus of Bronx Bethany Church of the Nazarene in the Williamsbridge section of the Bronx between Paulding and Bronxwood Aves.. 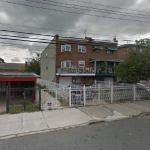 This location is easily accessed by the Bx8 bus (which runs from close to the office to the Throgs Neck Bridge) and a few blocks from the Bx31 bus (which runs from Westchester Square to Woodlawn). The 225th Street stop of the 2/5 trains is a few blocks away. For those driving, parking is likely to be found not far from the office. 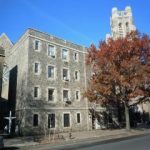 We are located on the campus of this church but on a neighboring street. This is what the outside of the office looks like. Angela has regularly scheduled hours at this location. or feel free to call us at 646-513-2865 or to reach out to the staff person you are interested in working with.